In February of 1971, California became the first state in the country to approve a legal certification program. 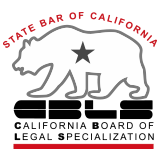 The California Board of Legal Specialization ("CBLS") began operations in 1973. The first three practice areas for certification as a specialist were tax law, criminal law and workers' compensation. Today, CBLS is the third largest attorney specialization program in the United States. It offers specialty certification in twelve different legal practice areas. CBLS estimates that approximately 3% of practicing attorneys in California are certified by CBLS. The State Bar also recognizes an additional eleven practice areas for certification through private entities accredited by the State Bar of California to certify such attorneys. The CBLS is supported by State Bar staff located in the The State Bar of California offices at 180 Howard Street in San Francisco, California. Under California Rule 1-400(D)(6), a lawyer may not claim he or she is a specialist unless he or she is certified by either the California State Bar Board of Legal Specialization or an entity approved by the Board of Governors. Board certified lawyers in California may seek and obtain more than one certification if otherwise qualified. The California Board of Legal Specialization (CBLS) consist of 15 members who meet approximately six times per year in State of California Bar offices. Members also participation on at least one subcommittee via teleconference is mandatory. The members of CBLS recommend rules and provide policies and guidelines for certification of specialists. Rule 9.35, adopted by the Supreme Court, contains a provision authorizing the State Bar of California to adopt rules to establish and administer a program to certify legal specialists. The Rules Governing the State Bar of California Program for Certifying Legal Specialists, adopted by the Board of Governors, contain the details of operation for the program. The Standards for Certification and Re-certification in each specialty area was adopted by the Board of Governors. The costs of the legal specialization program are entirely paid for by annual fees, as well as certification, re-certification, education provider, and accreditation fees. Section 20.8 of the Rules mandates that California's specialization program be self-supporting. The program is not subsidized by the dues collected from attorneys by the California State Bar. The annual budget for the program is prepared in accordance with the State Bar’s policies and directives and is subject to approval by the State Bar’s Board of Governors. According to the 23rd Annual Report of the CBLS dated May of 2010, for the 2009 calendar year the total expenses for the program were $1,188,254, compared to the $1,529,052 that was budgeted. One of the goals of the California Board of Legal Specialization is to give consumers another tool to use in selecting an attorney. Certified Legal Specialists are automatically listed by their specialty on the State Bar website and only certified specialists can be searched by practice area on the State Bar of California website using advanced search features. The website also contains a separate search function to find a specialist by county. Q&A: Legal Specialization a Boon for Consumers - Visit the California Bar Journal to learn more about benefits of becoming a certified legal specialist and what it means for the attorney’s practice. The article is a "question and answer" session with J. Scott Bovitz who served on the State Bar’s Board of Legal Specialization and the American Board of Certification. Lawyer Legion recognizes that this specialty certification program play an important role in helping the public find an attorney in California. This article was last updated on Tuesday, September 13, 2016.